So in the past I worked through Teachable, which was a good place to start but it didn't give me much freedom when it came to styling my courses and making them look on brand. Also the inside of the course looks a bit outdated and claustrophobic. When Squarespace reached out to me to collaborate (I used Weebly before), I saw it as the perfect opportunity to change hosts for my courses as well. Now I use Memberspace which is a plug-in for Squarespace. And oh boy, does it look a lot better! First off: I am able to create my course or membership on my website. Before with Teachable I had to make a separate account on their platform and couldn't embed my courses into my website. Now I make the course on my website and password-protect the pages and content with Memberspace. This means that my students can log in on my website and get access from there. This is good because now everything is centralised; my students don’t have to go to a separate platform to log in anymore. Not only is it better for my OCD mind that loves to have everything in one place, it’s also better for your website because it drives more traffic and engagement on your website. Students might come in to log into their account and then get inspired to check out your blog or the other products and services you offer. It’s a win. Before we get started in the how-to of this post I want to first make a clear distinction between courses and memberships. Courses, in my eyes, is content you buy once, and then have unlimited access to. A membership is based on a re-occuring payment plan (usually monthly). 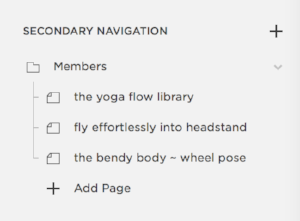 In my case, the membership I have created gives access to the Yoga Flow Library and gets updated weekly with new classes. The content evolves with time, in other words. My courses on the other hand, are fully created before they go live to be sold. Since I am using Memberspace, you’ll need a Squarespace website. You can create a free trial website for 14 days to play around and see if you like the functions Squarespace has to offer. And once you are ready to dive in, you can use the code ‘silke’ for 10% off your first purchase with them. Start by creating a page for your course. I created a folder in the secondary menu and called it ‘members’. In there I have a separate page for each course and membership. Don’t start filling your page just yet, you want to protect it first so that in the building phase, no one else has access to it. Go to memberspace.com and create an account. Here as well you can try out their service for free for the first 14 days. Once you have linked your website to your memberspace account, click on the tab ‘Member Pages’ and add the url of the pages you want to protect. You can password protect as many pages as you want! Now go back to the Squarespace back-end. For both my courses and memberships I first created a hidden blog (under ‘not linked’) and then linked the blog posts back to the course page (in the secondary menu) via the ‘Summary’ option. My favourite one is the Carousel function under Summary. I find this to be the cleanest and the most easy-to-navigate lay-out to use. But feel free to play around and see what suits your course best. So now on to the most time-consuming part: building the course! 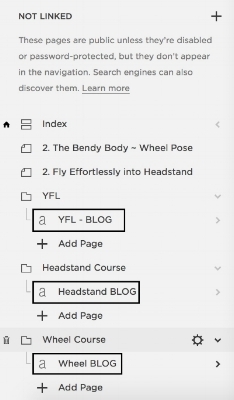 Create all your content and arrange it however you see fit. Make sure the page is easy to navigate for your students. If you are using the summary function like I recommended in step four, then make sure to group your posts by making different ‘categories’. For example for both my courses, I divided them into three pillars: 1. foundations, 2. trouble shooting, 3. yoga classes. So I would make sure to make three different categories for my blog posts: Pillar 1, Pillar 2 and Pillar 3. This way I can use the summary tool and ask it to only show blog posts within a certain category. Once you feel like your course is ready to be launched, go back to memberspace and click on the tab ‘Members Plans’. Create a new Member Plan for your course. You decide the payment type: whether it’s a one time payment, multiple payment or on a re-occuring schedule (like a membership). Fill out all the other details and you are done! PS: you can create multiple payment types for the same course. For example, if you sell a course for $100, you could decide to have a one-time payment option and a payment plan (called ‘multiple payment’ in memberspace) where the student can spread the payment over 2 or 3 months. Now your students will have the option to sign up for your course by clicking on the ‘Sign up/Log in’ Tab in the bottom right corner of your website. Voilà! That was it guys! Building a course really isn’t that hard at all. Especially when you have got easy to use tools like Memberspace and Squarespace. I hope this blog post was helpful and if you have any questions, leave them down below.